With so many delicious-sounding and -looking squash soup recipes popping up on food blogs, I had to try one too. But instead I took a shortcut and picked this up this package at Trader Joe's for some moment when a cupful of soup was needed in a minute flat. And it was good enough though to my taste, not as good as the creamy corn version from Day 153 nor even half so good as this Squash & Pear Soup. 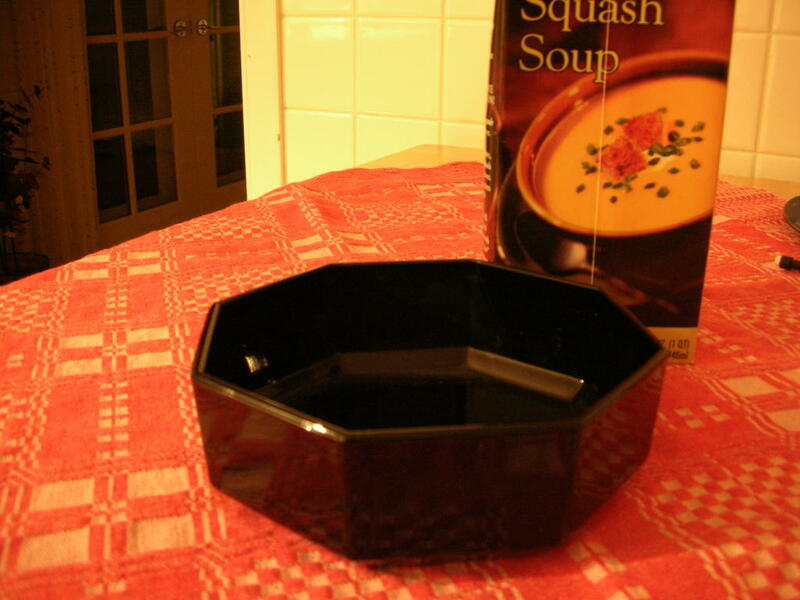 Pour a half cup soup into two small microwave-safe dishes and warm, separately, in the microwave for one minute apiece. Top with croutons or toasted pumpkin seeds or sour cream if you're feelin' fancy. Mrs C - If you read the post, you'll see that I was testing a Trader Joe's soup. Since then, I've posted several butternut squash soup recipes, the two favorites are included with My Favorite Winter Squash Recipes.